I joke that I’m addicted to sugar. But I guess it’s not really a joke. I truly am. I have intense sugar cravings after most meals and although my indulgences aren’t THAT bad for me most of the time, there’s no getting around the fact that added sugars aren’t good for you. 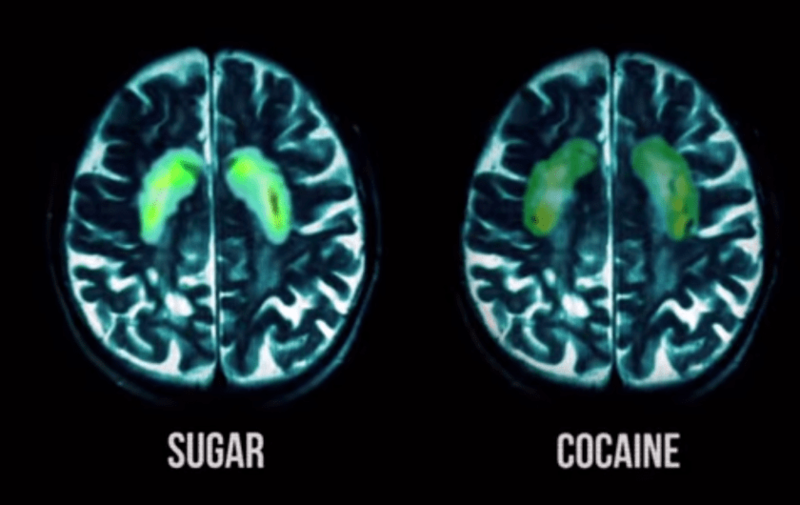 In fact, studies have found that sugar is as addictive as crack . (One family gave up sugar for a year and wrote a really interesting recap if you’d like to read it here). Although sugar doesn’t seem as obviously destructive to our health as crack, there are long term health effects of eating too much. I don’t need to preach on this topic, as I’m sure we’ve all heard it enough. I do, however, want to share my story of my sugar addiction. As a child, there were a plethora of desserts which rotated through my sweet tooth fix. As a child, my mom allowed me to take in two candies to the movies and I always had my favorite chocolate bar or sweet treat to bring with me. At the mall, I would also stock up on a MASSIVE bag of candy from the Sweet Factory. I’d walk to the local convenience store with my friends and buy things like Peachy Os, Sour Patch Kids, and Hot Tamales. I’d use my allowance to pay for theirs if they didn’t have any money so that I could get my fix. My candy bar of choice rotated between the Milky Way Dark, Whatchamacalit, and Rolo. I thought all kids ate as many sweets as I did and if they didn’t the only reason was that their mom’s wouldn’t let them. As I got older and realized that I was a little bigger than the average kid (to me, I was fat), I started to try diet sweets instead. 100 calorie pack cookies, fat free candy (because in the 90s, it was all about fat, not calories or sugar), Weight Watchers ice cream bars and then above all, frozen yogurt. For a long period of my life I was addicted to frozen yogurt. Under the guise that it was “healthy” dessert, I’d eat it anywhere from 3-6 times a week. I had physical cravings for it and would go out of my way to get my fix. It seriously like I was addicted to a drug. My friends all knew me as the yogurt lover and the people at Golden Spoon practically knew me. And unfortunately I didn’t realize that the advertised serving size and calorie content was WAY lower than reality and I was consuming upwards of 400-600 calories extra day unknowingly. I’d go to the gym and take a cardio kick boxing class and stop by Golden spoon on my way home for a medium with no topping (which is advertised at 10 oz and about 180 calories but in actuality is more like 22 ounces and 400 calories or more) and completely wipe out any caloric deficit I’d just created. No to mention that frozen yogurt is full of corn syrup and sugar. I struggled with my weight all through college and post college, fluctuating by as much as 20 pounds, and my yogurt addiction was a big part of that. I had the frozen yogurt serving size realization during P90X when we started weighing our food. Not coincidentally, I’ve maintained my P90X weight loss over the past 3 years (and haven’t had frozen yogurt in about two years). More importantly, P90X shifted my view of eating and directed me to making healthier, less processed choices. In 2012 when I switched to a mostly plant based diet, I eliminated a large portion of processed foods out of my life and now eat mostly whole foods. The great part about eating whole foods is that there aren’t any added sugars! Even though it’s obvious that my frozen yogurt, 100 calorie packs, cookies and other sweets are loaded with sugar, so many processed foods we eat every day have added sugar. The more food you eat with 1 ingredient, the less sugar you’re going to eat. Although I follow a mostly plant based diet and eat minimal processed foods, the three things I eat day to day that are processed are also loaded with sugar – flavored coffee creamer, KIND Bars and after dinner desserts such as almond milk ice cream bars, chocolate (dark if I’m being good!) and the occasional cookie. Of course there are times it’s much worse – cake, cookies, candy at parties and on a random day at work when I feel like it, but I’m not as worried about those as I am the day to day. After a couple particularly sugar-loaded weeks lately, I decided I wanted to try a 21 day sugar detox. I didn’t want to go all out and completely eliminate ALL sugar – like in fruit or carbohydrates (as a “mostly vegan” I’d be left to eat just vegetables and nuts basically), but I did want to really cut back on processed sugars. In the past life mentioned above, I had tried to go a week without sugar before and couldn’t last more than a day. In the last couple years I’ve notice I’m to quite as dependent but I’m still not sure I’ve gone without dessert in some form for longer than 3-4 days. I did some research and found that the “recommended” daily serving of sugar for a woman is 25 grams. I realized I was easily getting that serving just with my two coffees mixed with sugary creamer every morning. So my first switch was to buy a vegan coconut milk creamer with 4 g of sugar per tablespoon. My second switch was to only have one cup of coffee a day. The other switch was to substitute my afternoon KIND Bar with fruit and to eliminate all desserts. I am happy to report that I have gone a full week without desserts and I feel great! I do get sugar cravings but they actually aren’t as bad as I expected. I bought some strawberries and blackberries and eat small portions after dinner if I’m getting a craving. I found I don’t crave the second cup of coffee as badly when it’s not as sweet. I’m also sleeping better, which is likely due to the reduced caffeine intake but I wouldn’t be surprised if it had to do with the sweets too. I did take Gu on my long run and have been drinking my VegaOne recovery drink after hard workouts, because I know how important those sugars are in those moments. What will I do after the 21 days? I’m hoping to keep my coconut milk creamer & 1 coffee a day habit but I will still let myself enjoy dessert when a strong craving hits or I’m at a party or wedding. I am not going to completely deprive myself because I really do love dessert and I think in moderation it’s totally fine. Desserts are nicknamed “treats” for a reason – they should be enjoyed on special occasions, not every day! Do you have a sweet tooth ? Ever battled a sugar addiction? Have you tried a sugar cleanse? Thanks! I’m not following a plan but I do know there are several out there (I think here is one called the 21 day sugar detox or something like that). I’m just avoiding processed foods with added sugar really! I also switched to using vinegar and oil on salad instead of balsamic dressing bc it had sugar too! Thanks for writing this, Nicole! I am seriously addicted to sugar. After Ironman Canada (yup- almost nine months ago!) I let myself enjoy more treats and now can’t go without. It’s bad after every meal, but especially dinner. Please post again in a couple weeks to let us know how it went! This is a great post. Saw this article this morning and thought of it. It’s tough to choose what you are eating when everyone else is doing something else. Yes we both know that very well!! This is my life. Kind of!! I am absolutely addicted to sugar. Really just dessert though! I think it is my vice though. I don’t eat meat or drink alcohol. I don’t drink coffee or eat 100 calorie packs or frozen yogurt. The only candy I eat is peanut mnm’s. But I want a cookie or ice cream or a cupcake. I don’t want 1 or 1 scoop. I want like 10 cookies. (I am not lying!! :)) When I lived by myself it was easy to go and get a pint of ice cream and eat the entire thing. At least now that I live with my BF, he settles me down a bit. Since IM training started we try and “be good” during the week. Have a rice cake or an apple with nut butter. So on the weekend we can have some ice cream or cookie within reason!!! 🙂 That doesn’t make it any easier though!! I did a 30 day no treats last June. it went good but the cravings are that much worse when I go back to eating them. It is much easier for me to just try and limit them a little!! I do sleep better when I am not eating treats!! Great post!!! I’m sure the 21 days will be done before you know it! Sounds like you have found a good balance! I definitely find I crave sweets more and more the more i eat them so it’s getting easier by the day NOT to eat them! This is SUCH a problem for me too. I am totally addicted to sugar and bread. When I did paleo ofr 28 days last year, I could notice a difference in how I felt. I really need to challenge myself to do a detox like you. Maybe you will inspire me to try it again 🙂 Can’t wait to hear how you feel on day 21!